Recently, we had some friends visit us in our home in Cuenca, Ecuador. They only had one day before leaving for Lima, Peru, so we did our best to show them around our beautiful hometown in less than 24 hours. Our first stop was the double-decker tour bus to the Mirador de Turi, a lookout point above town, which costs $5. An alternative is the 25-cent blue bus that says “Turi.” It’s often a better option because it stops at Eduardo Vega’s home and workshop, where a vast array of souvenirs can be purchased from the world-renowned ceramicist. 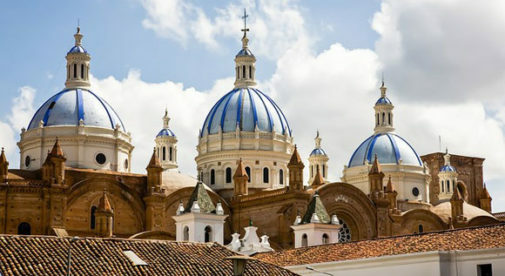 After admiring the panoramic view of Cuenca from the Mirador, we toured the historic church of Turi too. Looking from the Mirador de Turi allows you to take in the historic sites of Cuenca, as well as the hustle and bustle of the streets below. No trip to Cuenca is complete without a stroll through Parque Calderon—right smack dab in the middle of Cuenca—with a memorial to the hero Abdon Calderon, fountains, a gazebo, lush gardens, palms, and park benches. While there, you can visit the Nueva Catedral (New Cathedral) with its pink Italian marble gracing the floors and walls, Spanish-stained glass windows, and ornate architecture. 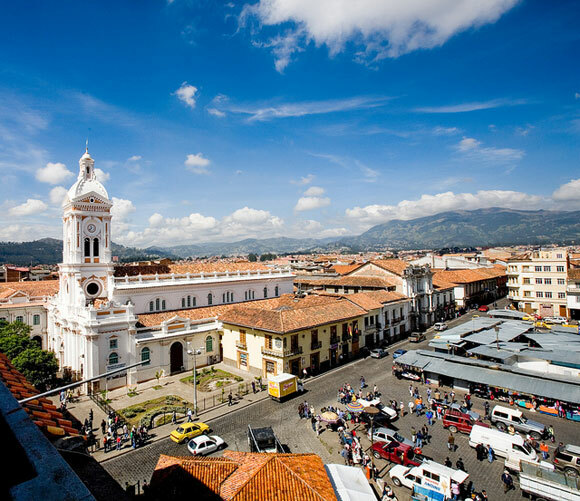 For $2, you can climb the winding staircase to the terrace of Nueva Cathedral for a jaw-dropping view of the city with its famous blue domes. If time permits, you can visit Iglesia Sagrario (the Old Church), which is directly across from the Nueva Catedral. Work began on the church in 1557 when the Spanish influence was most predominant. Our guests were enthralled by this gorgeous church, which is now a museum filled with religious artifacts, murals that reach from floor to ceiling, a representation of the Last Supper, and almost life-size wooden statues of the 12 disciples. 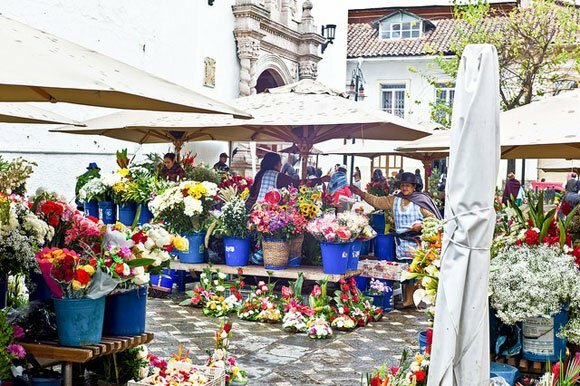 Plaza de las Flores is around the corner from the New Cathedral and is a favorite with tourists who marvel at a dozen roses for $2. Adjacent to the flower market is Carmen de Asunción Church, which has been meticulously preserved—right down to the gold pulpit and the Virgin Carmen, along with many religious works of art. If you’re still looking for souvenirs, San Francisco Plaza is near the flower market and has everything from Alpaca scarfs to leather goods (and even some Panama hats). To end the day, we took a $10 taxi ride to Dos Chorreras—a lodge nestled in the foothills of the Andes—and enjoyed the rustic atmosphere with a crackling fire and a view of the waterfalls. The rainbow trout dinner was a treat for our guests and they vowed to return.